NEW YORK (CNNMoney) — Watch out, LinkedIn. Facebook is jumping into the job search space, with a Social Jobs App that includes listings from services like Monster and BranchOut. “When it comes to economic growth, few issues are more important than matching qualified candidates with great jobs. 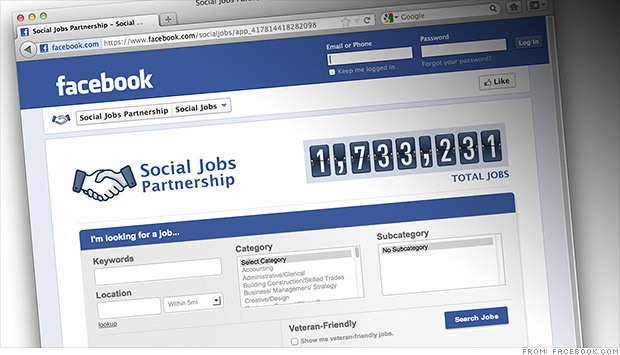 In that spirit, we know that the power of social media — the connections between friends, family and community — can have an outsized impact on finding jobs,” Facebook (FB) wrote. At launch, the Social Jobs App includes job listings from Monster (MWW), BranchOut, DirectEmployers Association, Work4Labs and Jobvite. Job seekers can search for positions based on industry, keywords and location. There’s also a special filter for veteran-friendly jobs.